^ 1.0 1.1 1.2 Overview of political relations. Delegation of the European Union to Ukraine. [2014-05-09] （英语）. ^ 朱冬传. 乌克兰与欧洲一体化进入快车道. 法制日报. 2013-10-22 [2014-05-04]. （原始内容存档于2014-05-12） （中文（简体）‎）. ^ 3.0 3.1 3.2 3.3 3.4 3.5 3.6 赵晨. 赵晨：欧盟与乌克兰关系回顾. 中国社会科学院欧洲研究所. 2014-01-13 [2014-05-04]. （原始内容存档于2014-05-12） （中文（简体）‎）. ^ 4.0 4.1 4.2 何卫. 乌克兰危机的内外因素分析. 当代世界. 2014, (2) [2014-05-16]. （原始内容存档于2014-05-31） （中文（简体）‎）. ^ 5.0 5.1 5.2 5.3 5.4 5.5 5.6 Chronology of bilateral relations. Delegation of the European Union to Ukraine. [2014-05-09] （英语）. ^ COMMUNIQUE OF THE MEETING BETWEEN MR. LEONID KRAVTCHOUK, PRESIDENT OF UKRAINE AND PRESIDENT JACQUES DELORS AND THE COMMISSION OF THE EUROPEAN COMMUNITIES ON SEPTEMBER 14, 1992 IN BRUSSELS. Press releases database. Communication department of the European Commission. 1992-09-14 [2014-05-09] （英语）. ^ 库奇马称乌战略目标是加入欧盟. 中国工程技术信息网 (基辅). 俄通社—塔斯社. 1999-11-30 [2014-05-16]. （原始内容存档于2014-05-31） （中文（简体）‎）. ^ 乌克兰总统对俄罗斯进行短暂访问. 新浪（原载中国青年报）. 1999-12-07 [2014-05-16] （中文（简体）‎）. ^ 杨闯. 东西摇摆的困局与宿命. 人民论坛·学术前沿. 2014-04-02 [2014-05-16] （中文（简体）‎）. ^ 任飞. 乌克兰与欧盟经贸合作关系浅析. 中国社会科学院俄罗斯东欧中亚研究所. [2014-05-16]. （原始内容存档于2014-05-31） （中文（简体）‎）. ^ 12.0 12.1 12.2 12.3 12.4 12.5 张学昆. [中东欧]欧盟东扩后的欧乌关系：“欧盟邻国政策”的视角. 欧洲研究. 2009, (6) [2014-05-05] （中文（简体）‎）. ^ 罗曼•奥莱亚契克. 乌克兰前总统被控涉嫌记者谋杀案. FT中文网 (基辅). 2011-03-25 [2014-05-10] （中文（简体）‎）. ^ 14.0 14.1 14.2 14.3 14.4 EU-Ukraine Summits: 16 Years of Wheel-Spinning. The Ukrainian Week. 2013-02-28 [2014-05-07] （英语）. ^ 黄晓东. 乌克兰 “选择欧洲”战略出台. 人民日报. 2002-06-28 [2014-05-16] （中文（简体）‎）. ^ 向欧洲标准不断靠拢 乌克兰“选择欧洲”战略出台. 新华网 (北京). 2002-06-28 [2014-05-16] （中文（简体）‎）. ^ 赵晨. 乌克兰危机中的欧盟. 学习时报. 2014-04-08 [2014-05-07]. （原始内容存档于2014-05-31） （中文（简体）‎）. ^ 18.0 18.1 18.2 张学昆. 论欧盟邻国政策的形成 (PDF). 国际政治研究. 2009, (3) [2014-05-16]. （原始内容 (PDF)存档于2014-05-31） （中文（简体）‎）. ^ 19.0 19.1 张学昆. 欧盟邻国政策的缘起及其与扩大政策的联系 (PDF). 国际论坛. 2010-05, 12 (3) [2014-05-10]. （原始内容 (PDF)存档于2014-05-31） （英语）. ^ 秘小胜. 欧盟召开首届欧洲睦邻政策大会. 国际在线. 2007-09-03 [2014-05-04] （中文（简体）‎）. ^ 田帆, 李洁. 欧盟主席称乌克兰将被纳入欧盟的睦邻政策框架. 新浪 (达沃斯). 2005-01-30 [2014-05-04] （中文（简体）‎）. ^ A Wider Europe - A Proximity Policy as the key to stability. Press releases database. Communication department of the European Commission. 2002-12 [2014-05-16] （英语）. We have to be prepared to offer more than partnership and less than membership, without precluding the latter. ^ 宋建. 欧盟委员会宣布2004年前欧盟东扩10国名单. 新华网 (北京). 2002-10-09 [2014-05-10] （中文（简体）‎）. ^ 24.0 24.1 Karatnycky, Adrian. Ukraine's Orange Revolution. Foreign Affairs. 2005 [2014-05-09] （英语）. ^ 乌克兰的橙色革命. 新浪（原载扬子晚报）. 2004-11-30 [2014-05-06] （中文（简体）‎）. ^ 赵晨. 欧盟如何向外扩展民主：历史、特点和个案分析. 世界经济与政治. 2007, (5) [2014-05-09]. （原始内容 (DOC)存档于2016-03-04） （中文（简体）‎）. ^ Stefan Wagstyl, Chrystia Freeland, Tom Warner. Yushchenko urges EU to admit Ukraine. Financial Times (Kiev). 2004-12-10 [2014-05-09] （英语）. ^ 29.0 29.1 李鼎鑫. 乌政府批准“乌克兰－欧盟”行动计划. 新华网 (基辅). 2005-02-13 [2014-05-17] （中文（简体）‎）. ^ 李茜. 国际观察：欧盟-乌克兰峰会在巴黎举行. 国际在线. 2008-09-10 [2014-05-04] （中文（简体）‎）. ^ 严明. 欧盟将与乌克兰签订联系国协定. 新华网 (巴黎). 2008-09-10 [2014-05-17] （中文（简体）‎）. ^ 俄罗斯切断对乌克兰天然气供应 称西欧不受影响. 中国日报. 2006-01-01 [2014-05-24]. （原始内容存档于2014-05-31） （中文（简体）‎）. ^ 37.0 37.1 新年伊始俄给乌克兰“断气” 欧盟着急上火. 中国日报. 2006-01-02 [2014-05-24]. （原始内容存档于2014-05-31） （中文（简体）‎）. ^ 岳连国. 俄警告乌不要截留经乌境输往欧盟国家的天然气. 新华网 (莫斯科). 2006-01-02 [2014-05-24] （中文（简体）‎）. ^ 岳连国. 俄决定增加“经乌入欧”的天然气输气量. 新华网 (莫斯科). 2006-01-03 [2014-05-24] （中文（简体）‎）. ^ 陈畅, 宋宗利. 乌克兰否认截留俄罗斯天然气. 新华网 (基辅). 2006-01-02 [2014-05-24] （中文（简体）‎）. ^ 俄乌解决天然气争端并签署相关合同. 新浪（原载新华网）. 2006-01-04 [2014-05-24] （中文（简体）‎）. ^ 赵嘉麟. 俄罗斯天然气公司证实已停止向乌克兰供气. 新浪（原载新华网） (莫斯科). 2009-01-01 [2014-05-22] （中文（简体）‎）. ^ 欧盟担忧俄乌重演"断气"风波 敦促两国恢复供气. 中国新闻网. 2009-01-03 [2014-05-24] （中文（简体）‎）. ^ 尚军. 欧盟说天然气供应大幅减少完全不可接受. 新华网 (布鲁塞尔). 2009-01-06 [2014-05-24] （中文（简体）‎）. ^ 王坚. 欧盟威胁将干预俄乌天然气争端. 新浪（原载国际在线）. 2009-01-08 [2014-05-24] （中文（简体）‎）. ^ 赵嘉麟. 俄罗斯否认中断经乌向欧盟供气. 新浪（原载新华网） (莫斯科). 2009-01-08 [2014-05-24] （中文（简体）‎）. ^ 田冰. 欧盟派独立观察员监督俄罗斯天然气过境乌克兰. 中国新闻网 (莫斯科). 中新社. 2009-01-09 [2014-05-23] （中文（简体）‎）. ^ 黎明, 宋宗利. 欧盟观察员抵达乌克兰监测俄天然气过境运输. 新浪（原载新华网） (基辅). 2009-01-10 [2014-05-24] （中文（简体）‎）. ^ 赵嘉麟. 俄罗斯中断经乌克兰向欧盟国家供气. 新华网 (莫斯科). 2009-01-08 [2014-05-23] （中文（简体）‎）. ^ 赵嘉麟. 俄罗斯将在欧盟观察员抵乌后恢复供气. 新浪（原载新华网） (莫斯科). 2009-01-08 [2014-05-24] （中文（简体）‎）. ^ 52.0 52.1 俄乌天然气争端对欧洲18国造成影响(图). 新浪（原载新京报）. 2009-01-09 [2014-05-22] （中文（简体）‎）. ^ 林惠芬. 罗马尼亚宣布天然气供应进入紧急状态. 新华网 (布加勒斯特). 2009-01-07 [2014-05-23] （中文（简体）‎）. ^ 欧洲18个国家因俄乌天然气争端受影响. 新浪（原载中国青年报）. 2009-01-16 [2014-05-24] （中文（简体）‎）. ^ 新浪（原载中国网）. 2009-01-13 [2014-05-24] （中文（简体）‎）. ^ 乌克兰称将被迫继续截留俄过境天然气. 新浪（原载中国网）. 2009-01-13 [2014-05-24] （中文（简体）‎）. ^ 乌克兰称暂不恢复对欧供应俄天然气. 中国日报. 2009-01-14 [2014-05-24] （中文（简体）‎）. ^ 田冰. 俄乌总理就天然气价格等达成一致 很快恢复供气. 新华网 (莫斯科). 中新社. 2009-01-18 [2014-05-24] （中文（简体）‎）. ^ 张碧弘. 欧盟对俄乌达成恢复供气协议表示欢迎. 新华网 (布鲁塞尔). 2009-01-18 [2014-05-24] （中文（简体）‎）. ^ 许欣. 欧盟认为输欧天然气依然受阻“没有理由”. 国际在线. 2009-01-19 [2014-05-24] （中文（简体）‎）. ^ 欧盟证实俄天然气已抵达欧洲. 新浪（原载中国新闻网）. 2009-01-20 [2014-05-24] （中文（简体）‎）. ^ 欧盟染指乌克兰管道 俄乌再生天然气争端. 俄罗斯新闻网 (莫斯科). 2009-03-24 [2014-05-24]. （原始内容存档于2014-05-31） （中文（简体）‎）. ^ 张碧弘. 欧委会敲定“东部伙伴关系”计划建议. 新华网 (布鲁塞尔). 2008-12-04 [2014-05-17] （中文（简体）‎）. ^ 刘黎, 张碧弘. 欧盟与欧亚６国启动“东部伙伴关系”计划. 新华网 (布拉格). 2009-05-08 [2014-05-17] （中文（简体）‎）. ^ 欧盟“东部峰会”冷场 俄罗斯死守战略屏障. 新华网（原载中国新闻网）. 2009-05-08 [2014-05-17] （中文（简体）‎）. ^ Pop, Valentina. EU expanding its 'sphere of influence,' Russia says. euobserver (Brussels). 2009-03-21 [2014-05-17] （英语）. The strategic priority of our country is integration in the EU. This is the way to modernise our country and we welcome the Eastern Partnership policy, because it uses de facto the same instruments as for EU candidates. We know it's not about membership, but membership is also not completely ruled out for the future. ^ 68.0 68.1 68.2 亚努科维奇： “橙色革命”终结者. 人民网. 2010-08-11 [2014-05-25] （中文（简体）‎）. ^ 69.0 69.1 金钟. 亚努科维奇赢得乌克兰大选 季莫申科称有舞弊现象. 国际在线. 2010-02-09 [2014-05-25] （中文（简体）‎）. ^ 季莫申科宣布永不承认亚努科维奇合法获胜. 新华网（原载环球网）. 2010-02-09 [2014-05-25] （中文（简体）‎）. ^ 李自国. 乌克兰亚努科维奇政府的对外政策走向. 中国国际问题研究厅. 2011-08-03 [2014-05-28] （中文（简体）‎）. ^ 金力. 亚努科维奇说发展乌欧关系是乌外交重心之一. 国际在线. 2010-03-02 [2014-05-31] （中文（简体）‎）. ^ 乌克兰前总理季莫申科被判7年监禁. 凤凰网. 2011-10-11 [2014-05-31] （中文（简体）‎）. ^ 宗新. 季莫申科越权案今日判决. 新京报. 2011-10-11 [2014-05-31]. （原始内容存档于2011-10-14） （中文（简体）‎）. ^ 橙色革命偶像季莫申科被判七年徒刑. 法国国际广播电台中文频道. 2011-10-11 [2014-05-31] （中文（简体）‎）. ^ 柳洪杰. “乌克兰玫瑰”季莫申科被判7年监禁 各方施压或有转机. 中国日报. 2011-10-13 [2014-05-31] （中文（简体）‎）. ^ 欧盟称季莫申科入狱将影响欧盟与乌克兰关系. 中国日报. 2011-10-12 [2014-05-31] （中文（简体）‎）. ^ 乌克兰前总理季莫申科被判7年 或冲击乌欧关系. 腾讯（原载潇湘晨报）. 2011-10-12 [2014-05-31] （中文（简体）‎）. ^ European Union and Ukrainian Negotiators initial Association Agreement, including Deep and Comprehensive Free Trade Area (30/03/2012). Delegation of the European Union to Ukraine. 2012-03-30 [2014-05-31] （英语）. ^ 孙闻. 欧盟、乌克兰草签联系国协定. 新华网 (布鲁塞尔). 2012-03-31 [2014-05-31] （中文（简体）‎）. ^ 16th EU-Ukraine Summit: Joint Statement (26/02/2013), Delegation of the European Union to Ukraine, 2013-02-26 [2014-05-31] （英语）, 3. The leaders reaffirmed their commitment to the signing of the already initialed Association Agreement, including a Deep and Comprehensive Free Trade Area, as soon as determined action and tangible progress are demonstrated in the three areas emphasized at the 2011 EU-Ukraine Summit, possibly by the time of theEastern Partnership Summit in Vilnius in November 2013. Therefore, Ukraine is determined to comply with those areas/elements specified by the Conclusions of the 10 December 2012 Foreign Affairs Council of the European Union to this end. They agreed to focus on these issues as a matter of priority. The signing could be accompanied by an opening for provisional application of parts of the Agreement. 4. The leaders took note of the actions taken so far by Ukraine, and looked forward to it achieving concrete progress by early May 2013. ^ 孙闻. 欧盟与乌克兰为签署联系国协定设定期限. 新华网 (布鲁塞尔). 2013-02-26 [2014-05-31] （中文（简体）‎）. ^ 胡晓光. 乌克兰总理表示希望与欧盟签署联系国协定. 新华网 (基辅). 2013-08-15 [2014-05-31] （中文（简体）‎）. ^ 张伟. 新闻分析：乌克兰与欧盟正式签署联系国协定存变数. 新华网 (布鲁塞尔). 2013-11-19 [2014-05-31] （中文（简体）‎）. ^ Ukrainian president asks for laws to be passed to facilitate EU association agreement. Euronews. 2013-09-03 [2014-05-31] （英语）. ^ 刘旭. 乌克兰暂停与欧盟签署联系国协定 普京表态愿意对话. 人民网 (莫斯科). 2013-11-22 [2014-03-21] （中文（简体）‎）. ^ 乌克兰议会否决有关季莫申科法案. 德国之声. 2013-11-21 [2014-03-21]. （原始内容存档于2013-11-22） （中文（简体）‎）. ^ Ukraine drops EU plans and looks to Russia. Al Jazeera. 2013-11-21 [2013-03-28] （英语）. ^ Ukraine to resume preparing agreement with EU when compensation for production drop found – Boiko. Interfax-Ukraine. 2013-11-21 [2013-05-03] （英语）. "The Ukrainian government will suspend the negotiations for signing the Association Agreement with the EU, until we find a solution for the situation is found and when the drop in industrial production and our relations with CIS countries are compensated by the European market, otherwise our country's economy will sustain serious damage," Boiko said at the news conference in Kyiv on Thursday. ^ 丁飞, 候涛. 欧盟峰会未能拉住乌克兰 俄与欧盟拉力赛将继续. 环球网. 2013-11-30 [2014-05-03] （中文（简体）‎）. ^ Противники приостановки евроинтеграции Украины в ночи вышли на улицы Киева. NEWSru. 2013-11-22 [2014-03-21]. （原始内容存档于2014-01-25） （俄语）. ^ 乌克兰民众示威支持乌欧一体化. 青岛日报. 2013-11-23 [2014-03-21] （中文（简体）‎）. ^ 王一. 乌克兰防暴警察暴力清场示威人群 欧美强烈谴责. 环球网. 2013-12-01 [2014-03-29]. （原始内容存档于2014-03-29） （中文（简体）‎）. ^ Laura Smith-Spark, Ray Sanchez. Ukraine police accused of violent crackdown on pro-EU protests. CNN. 2013-11-30 [2014-03-29] （英语）. ^ 乌克兰反政府示威持续 西方国家谴责警方使用暴力. 中国网. 2013-12-02 [2014-03-29] （中文（简体）‎）. ^ Kyiv, Brussels conduct technical discussion of future EU-Ukraine dialogue on AA. Interfax=Ukraine. 2013-12-05 [2014-05-31] （英语）. 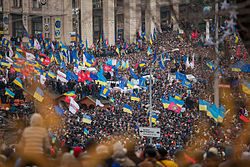 ^ Ukraine, EU trade talks suspended amidst rallies. CBC News. 2013-12-15 [2014-05-31] （英语）. ^ Ukraine police move on protesters and opposition party. BBC. 2013-12-09 [2014-04-12] （英语）. EU foreign policy chief Catherine Ashton will be in Ukraine on Tuesday and Wednesday "to support a way out of the political crisis".Baroness Ashton will hold talks with government officials, opposition activists and civil society groups. ^ Ashton, Yanukovych have talks in Kyiv. Interfax-Ukraine. 2013-12-10 [2014-04-12] （英语）. According to earlier reports, Ashton intends to meet with Ukrainian government officials, opposition, and representatives of civil society. ^ Ashton's visit to Kyiv is not substitution for Cox-Kwasniewski mission – European Commission. Interfax-Ukraine. 2013-12-09 [2014-04-12] （英语）. Ashton will visit Ukraine on December 10-11. She is expected to meet Ukraine's governmental officials, opposition figures and representatives of civil society. ^ 俄乌签多项经济合作协议. 大洋新闻 (广州日报). 2013-12-19 [2014-04-22]. （原始内容存档于2013-12-19） （中文（简体）‎）. ^ EU to sign association agreement with Ukraine as soon as Ukraine is ready for it - Rompuy. Interfax-Ukraine. 2013-12-20 [2014-04-26] （英语）. ^ EU-Ukraine partnership treaty not to infringe on Russia's interests, says EU Council president. Interfax-Ukraine. 2013-12-20 [2014-04-26] （英语）. ^ EU not concerned about Ukraine's signing agreement with Russia, says Barroso. Interfax-Ukraine. 2013-12-20 [2014-04-26] （英语）. ^ Ukraine to resume association agreement talks with EU after winter holidays, says foreign minister. Interfax-Ukraine. 2013-12-24 [2014-05-31] （英语）. ^ 乌克兰议长图尔奇诺夫暂行总统职责 系季莫申科密友. 新京报. 2014-02-24 [2014-05-31] （中文（简体）‎）. ^ 王修君. 乌克兰议会批准亚采纽克出任新政府总理. 中国新闻网 (基辅). 中新社. 2014-02-28 [2014-05-31] （中文（简体）‎）. ^ 凯文. 欧盟呼吁乌克兰保持统一和完整. 法国国际广播电台中文频道. 2014-02-23 [2014-05-31] （中文（简体）‎）. ^ 欧盟外交政策首脑阿什顿周一访问乌克兰. 美国之音. 2014-02-24 [2014-05-31] （中文（简体）‎）. ^ Foreign Affairs Council Conclusions on Ukraine (04/03/2014). Delegation of the European Union to Ukraine. 2014-03-04 [2014-05-31] （英语）. The Council reconfirms its offer of the Association Agreement, including a Deep and Comprehensive Free Trade Area. ^ European Commission's support to Ukraine. Press releases database (Brussels: Communication department of the European Commission). 2014-03-04. ^ 欧盟“慷慨解囊” 乌克兰入账110亿欧元. 潇湘晨报. 2014-03-06 [2014-05-31]. （原始内容存档于2014-05-31） （中文（简体）‎）. ^ First tranche of EU Macro-Financial Assistance disbursed to Ukraine (20/05/2014). Delegation of the European Union to Ukraine. 2014-05-20 [2014-05-31] （中文（简体）‎）. ^ European Commission proposes temporary tariff cuts for Ukrainian exports to the EU (12/03/2014). Delegation of the European Union to Ukraine. 2014-03-12 [2014-05-31] （英语）. ^ 欧盟将对乌克兰输欧产品给予关税减免. 中华人民共和国财政部关税司. 2014-03-13 [2014-05-31] （中文（简体）‎）. ^ 欧盟通过对乌克兰临时贸易优惠措施. 中国新闻网（原载新华网）. 2014-04-15 [2014-05-31] （中文（简体）‎）. ^ 乌克兰与欧盟签署联系国协定政治部分. 乌克兰国家通讯社. 2014-03-24 [2014-05-31] （中文（简体）‎）. ^ 乌欧签署联系国协定政治部分 俄完成克里米亚入俄法律程序. 新华网. 2014-03-22 [2014-05-10] （中文（简体）‎）. ^ 乌克兰推迟与欧盟签署联系国协定经济部分. 国际在线. 2014-03-18 [2014-05-31] （中文（简体）‎）. ^ 烏克蘭與歐盟簽署經貿協議 總統波若申科：準備面對俄羅斯保衛國家 | NOWnews今日新聞. [2016-10-06]. ^ 烏克蘭加入歐盟第一步 雙方簽署協議 - 大紀元. 2014-09-17 [2016-10-06] （中文（繁體）‎）. （简体中文） 赵晨. 欧盟如何向外扩展民主：历史、特点和个案分析. 世界经济与政治. 2007, (5). （原始内容存档于2016-03-04）.